Reno, NV -- The Economic Development Authority of Western Nevada (EDAWN) announced that Mary’s Gone Crackers®, a manufacturer of organic and gluten-free healthy snacks will be opening a manufacturing and R&D facility in Reno, Nevada. The company headquarters will also be relocated to this site with plans to be operational by this fall. Mary’s Gone Crackers intends to hire over 200 employees by the end of 2017. They were awarded business incentives in March 2016. Suffolf, VA -- Panattoni Development Company, one of the largest privately held full-service real estate development companies in the world, announced plans to develop its first industrial project in Virginia, at Virginia Regional Commerce Park in Suffolk. The 300,000 SF Class A industrial building will begin construction later this summer and is anticipated to be ready for tenant occupancy in spring 2017. The new project will be the first speculative industrial development in Hampton Roads since 2007, and the second building at Virginia Regional Commerce Park. Virginia Regional Commerce Park is strategically located at the major cross roads of Route 460 and Route 58, approximately 20 miles from Port of Virginia facilities and 45 miles from Interstate 95. The new building will be divisible for industrial tenants and will feature 32’ ceiling heights, 50’ X 50’ column spacing and an ESFR sprinkler system with ample trailer storage. Harrisburg, PA – Governor Tom Wolf announced that Amazon will expand its presence in Pennsylvania and has committed to the creation of at least 5,000 new, full-time jobs statewide. Amazon will expand its fulfillment and distribution operations in Pennsylvania at multiple new sites throughout the commonwealth, marking the first with a recent lease agreement in Palmer Township, Northampton County. “Being number one in new commercial investment is always an achievement. But being number one in back-to-back years is proof that Loudoun County has become a premier business location in the Commonwealth of Virginia,” says Buddy Rizer, Loudoun Economic Development’s executive director. SmartAsset, a New York-based financial technology company, has ranked Loudoun County #1 in investment in Virginia for the second year in a row. The annual study ranked counties in four areas: (1) the growth in the number of businesses established in the county over a three-year time frame; (2) GDP growth in the local economy; (3) the number of new building permits per 1,000 homes, and (4) the total municipal bond debt raised by the county over the past five years, divided by the number of residents. Last week, Port of South Louisiana Executive Director Paul G. Aucoin along with Commission President D. Paul Robichaux, Commission Treasurer P. Joey Murray, III, and Commission Secretary Stanley Bazile returned from a 94-member trade mission to Cuba led by Louisiana Commissioner of Agriculture, Mike Strain. The trade mission delegation was comprised of representatives from Louisiana export facilities, rice growers, shipping businesses, and bankers, plus members of the State of Louisiana Legislature and Louisiana Economic Development. Port of South Louisiana -- On Monday, July 18th, the American Association of Port Authorities (AAPA) announced the recipients of the 2016 AAPA Communication Awards Program. The Port of South Louisiana (PSL) received two Awards of Merit from the organization: one for the quarterly PortLog journal and the other for website re-design. After much encouragement and deep consideration, the Port of South Louisiana contracted Renaissance Publishing Company to implement quarterly editions of its PortLog, which is distributed to over 3,000 companies around the U.S. In the past, the Port of South Louisiana seemed to have a lack of name recognition even though it is the largest tonnage port in the Western Hemisphere. Trenton, NJ -- World Business Lenders (WBL), a provider of short-term business loans, celebrated the new location of its corporate headquarters in Jersey City with a ribbon cutting ceremony. The company’s new 35,040-square-foot offices at 101 Hudson Street will be home to 225 employees by the end of the year. WBL’s decision to locate in New Jersey was supported by a Grow New Jersey (Grow NJ) award approved by the New Jersey Economic Development Authority (EDA) in February. Grow NJ tax credits of up to $16.8 million over ten years encouraged the company to choose to locate in Jersey City rather than a competing location in Queens, New York. The project is expected to have a net benefit to the State of more than $85 million over 20 years. Trenton, NJ -- Stressing the importance of keeping critical infrastructures operational during natural disasters, the Board of the New Jersey Economic Development Authority (EDA) today awarded preliminary approval for the funding of two projects under the Energy Resilience Bank (ERB). One project is a combined heat and power (CHP) system at Cooper University Hospital (CUH) and the other is a resiliency project at the Bergen County Utilities Authority (BCUA), which provides wastewater treatment and solid waste management for more than 500,000 people. Created by the Christie Administration in the aftermath of Superstorm Sandy, the ERB is the first public infrastructure bank in the nation to focus on energy resilience. Administered by the EDA, the ERB is utilizing $200 million from New Jersey’s second Community Development Block Grant-Disaster Recovery (CDBG-DR) allocation to support the development of distributed energy resources (DER) at critical facilities throughout the state that will enable them to remain operational during future outages. Lubbock, TX -- The Lubbock Economic Development Alliance (LEDA) and Market Lubbock, Inc. announced the creation of 580 new jobs and a $9.92 million capital investment at a press conference Wednesday afternoon. The additional jobs come as a result of the expansion of one local business and the expansion of another new business to the Lubbock community. Severn Peanut Company, a division of Meherrin Agriculture, is expanding its operations by opening a new food processing facility in Lubbock, which is scheduled to open at the end of 2016. The expansion will create 80 new jobs, and the company will make an initial $8.75 million capital investment. Alexandria, VA -- The American Association of Port Authorities (AAPA)… the unified and recognized voice of seaports in the Americas…will recognize 25 seaports for exemplary communications projects and programs at its annual convention and awards luncheon this fall. Winning entrants in AAPA’s 50th annual Communications Awards Program will be recognized at an Oct. 26 awards luncheon in conjunction with AAPA’s 105th Annual Convention and Expo in New Orleans, which runs Oct. 23-26. The recipients of the 2016 Overall Award of Communications Excellence trophies - the top awards in AAPA's Communications Awards Program - are Port Everglades in Florida (Category 3); St. John's Port Authority in Newfoundland and Labrador (Category 2); and the Port of Grays Harbor in Washington (Category 3). Each of the three categories of ports is based on the size of the port's public relations/advertising/marketing budget. Pavas, Costa Rica -- Concentrix, a global high value business services company, is expanding its operations in Costa Rica. The company will add 700 talented employees and has begun construction of its fourth building located in Pavas. The construction of the new building was announced last June 2015 and the building is expected to be fully operational by the end of this year. Corpus Christi, TX -- Port Corpus Christi and Martin Midstream Partners announced the construction of Oil Dock 15 on the Northside of the Inner Harbor. A groundbreaking ceremony will be held Thursday, July 14 at 10:00 a.m. In 2012, long time Port customer, Martin Midstream, began increasing its presence by adding new crude oil storage tanks and trans-loading capabilities. These efforts have resulted in Martin Midstream being named one of the Port’s top five customers in 2015. Now, just as the United States Government’s ban prohibiting the exportation of crude oil has been lifted, the Port and Martin Midstream have finalized negotiations for the construction of the new crude oil dock. Oil Dock 15 will accommodate trans-loading through a new 24” pipeline originating from Martin’s 900,000 barrel POCC crude oil terminal. Lansing, MI -- Denso Manufacturing Michigan Inc., a manufacturer of automotive air conditioning and engine cooling systems, is expanding in Battle Creek. The company plans to add new manufacturing capabilities at its Battle Creek facility to support additional sales with its North American customers, investing more than $37 million and creating 125 jobs, it said Wednesday. The project was been awarded a $687,500 Michigan Business Development Program performance-based grant. The city of Battle Creek and/or Battle Creek Unlimited will support the project through training and relocation assistance, the Michigan Economic Development Corp. said Wednesday. Montgomery, AL -- At a groundbreaking ceremony, German auto supplier Gerhardi Kuntstofftechnik announced plans to invest $37.9 million and create 235 jobs in Montgomery to create its first North American manufacturing facility. “This is a great opportunity for Gerhardi, and we are very excited,” Gerhardi Managing Director Reinhard Hoffman said. “Montgomery Industrial Park offers a great infrastructure, attractive support and is located close to many OEMs (original equipment manufacturers). Berlin, Germany -- Arkansas Governor Asa Hutchinson today officially opened Arkansas’ new European office in Berlin, Germany. The opening of the Arkansas office was celebrated with a reception at the U.S. Embassy in Berlin hosted by U.S. Ambassador to Germany John B. Emerson. Cornelius Schnitzler, a German national with a background in economics and trade, will run the new Arkansas office and work closely with Lenka Horakova, the Arkansas Economic Development Commission’s (AEDC) Director of Business Development for Europe. This is Arkansas’ third international office. The state has maintained offices in Japan and China for several years. Schnitzler was chosen because of his established business relationships in Europe. He is fluent in German, English and French. Germany is the largest foreign direct investor in Arkansas with more than 30 German subsidiaries located in the state. Brownsville, TX -- International Shipbreaking, LLC. Vice President Robert Berry has been appointed to the Marine Transportation System National Advisory Council (MTSNAC) by U.S. Department of Transportation Maritime Administrator Paul N. Jaenichen. Mr. Berry has more than 30 years of experience in the marine recycling industry, including managing the dismantling/recycling of Navy and commercial ships, drilling rigs and other maritime equipment. Charleston, SC -- The Agriculture Transportation Coalition (AgTC) recently named Jim Newsome, SCPA president and CEO, the first Person of the Year award recipient in the Coalition's 28-year history. "Never has an individual so distinguished himself in a manner that will have such a positive impact on all participants in ocean shipping, shippers, carriers, ports and terminals," said Peter Friedmann, Executive Director, AgTC. "We applaud Jim Newsome for his pivotal, groundbreaking leadership to find a solution to the SOLAS container weight threat." Alexandria, LA -- Gov. John Bel Edwards and SolScapes owner Iviana Stewart announced today that the company will make a $2 million capital investment and create 40 new direct jobs to expand its utility rights-of-way maintenance operation in Rapides Parish. The company, based in Lecompte, Louisiana, performs a range of contracted services for utility and pipeline companies. With the expansion, SolScapes will add 40 new direct jobs with an average annual salary of $28,000, plus benefits, while retaining 35 existing jobs. Louisiana Economic Development estimates that the project also will result in 14 new indirect jobs, for a total of nearly 50 new jobs in Rapides Parish and Central Louisiana. Antarctica -- At the end of February 2016, mechatronics lead Kevin Bass of Intuitive Machines and contracted pilot Mike Laible set off on a planned excursion to Antarctica. 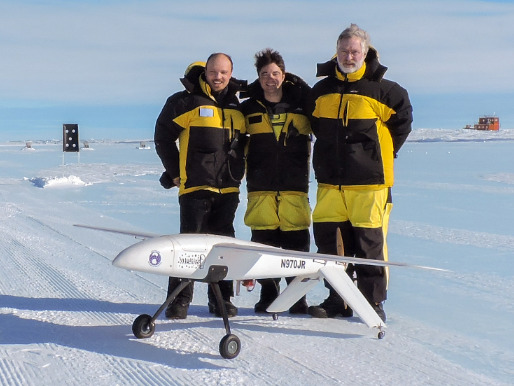 In cooperation with the UTIG (University of Texas Institute for Geophysics) and ICECAP (Investigating the Cryospheric Evolution of the Central Antarctic Plate) Intuitive Machines successfully flew multiple runs with a 3W-powered unmanned aerial vehicle platform, Tiburon Jr., on the coast of Antarctica. Birmingham, AL -- Motion Industries, Inc., a leading distributor of maintenance, repair, and operation replacement parts and a wholly owned subsidiary of Genuine Parts Company (NYSE: GPC), is pleased to announce the building of a new, expanded distribution center (DC) near Dallas, TX. The facility is scheduled to open in March 2017, and will be managed by Dan Krska. The new address of the building site, on which Motion has just broken ground, will be 200 W. Trinity Boulevard, Grand Prairie, Texas. "The new facility will provide excellent proximity for our current market and employee base," said Joe Limbaugh, Motion Industries Vice President, Operations. "The larger space will allow us to grow our industrial supply segment, and adequately fill customer demand in this region. As well, Motion's 5-star processes and technologies will be implemented as part of the new design, which will accelerate our speed to market." Columbia, SC -- Central Packaging and Crating, Inc., a manufacturer of wooden heat-treated pallets, is expanding its operations in Greenwood County. The expansion will result in a new capital investment of almost $1 million. Launched in 1998, Central Packaging and Crating is one of the largest wooden pallet manufacturers in South Carolina by volume. In an effort to meet increased customer demand, the company is investing in new in-house machinery at its Greenwood County facility such as upgraded automated nailers and gang saws. Once installed, the facility will be capable of producing up to 250 pallets per hour and almost 3,000 pallets per day.